Bagnet at its best! We are not lying when we say its "Bagnet at Its Best"! The dish made famous by Ilokanos but made even better by us. 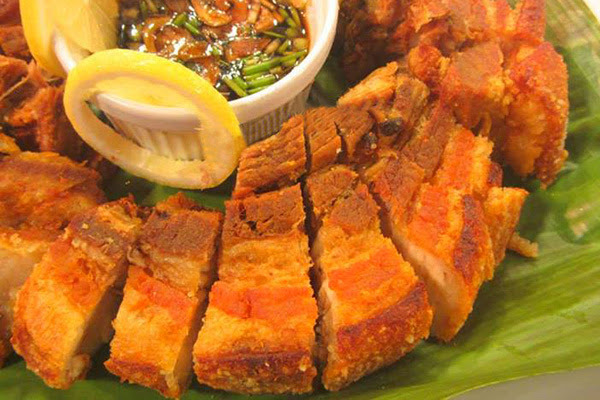 A secret marinade that made the bagnet tender, juicy and tasty plus a more crispy skin! Give it a try! 3. Cover and bring to a boil, then lower heat to simmer for 45 minutes to 1 hour or until pork is tender. 4. Remove from the pot and place in a colander and let sit for a while so the liquid will drain. Prick the skin many times using fork then dry with paper towels if necessary. Brush lightly with patis. Keep refigerated for several hours. 5. In a large kawali, heat enough cooking oil and deep fry pork belly at low heat for 30-45 minutes or until the pork turns brown. When the skin side is up, ladle cold water onto the skin. 6. Remove pork belly from the kawali and drain oil in a colander or paper towels, allow to cool completely. 7. Chop bagnet to serving pieces and serve immediately with rice, sukang ilocos or tomatoes or onions.